You get 20 pairs of Baldwin original precuts. 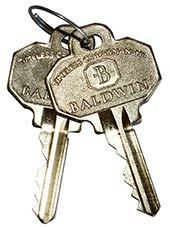 These are the high quality nickel silver keys, in ringed pairs. Key cuts are stamped on reverse side.